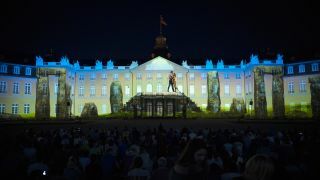 Maxin10sity was engaged in the German city of Karlsruhe in 2015 to deliver the Schlosslichtspiele (light projection on the palace façade) to mark the city’s 300th anniversary by the Karlsruhe Centre for Art and Media (ZKM), Maxin10sity has returned every year since. Always keen to raise the bar, 2018’s spectacle - titled I’MMORTAL (Immortal / I am mortal) – combined Maxin10sity’s trademark projection mapping with acrobatic acts to create a new visual genres. Maxin10sity co-founder and creative director, András Sass, took the lead on the project and reflects on the early conceptual stage. ZKM’s Nina Wlodarczyk project manages the Schlosslichtspiele, and has worked with Maxin10sity over the past four editions. This year’s new approach, believed to be a world first, certainly impressed the audience – with over 350,000 visitors watching almost 80 performances over a 6-week duration. It all began with a conversation after the 2017 show, when Sass put forward the idea of incorporating acrobats as actors in the architectural mapping. Maxin10sity was given the creative freedom to pursue it. “Our previous shows in Karlsruhe (300 Fragments in 2015, Legacy in 2016, and Structures of Life in 2017) all had a strong point of reference back to the city, but this year, we chose to open it up a bit more and take on a more philosophical theme. We started to explore what it might mean to live forever and what there might be after death. The topic was of great interest to me, and inspired by my love of Anne Rice’s books which for those who know them, touch on themes around eternal life,” said Sass on how the story for I’MMORTAL emerged. The main protagonist of the resulting story is Asheem, who is searching for the meaning of immortality following a tragic accident, which gives him the opportunity to experience the grace of infinite time. During his trip he travels a huge distance in space and time and takes the way to heaven and hell, as the show invites the spectator to question where these routes really lead to, and whether immortality is indeed a part of all of us. Maxin10sity engaged the acrobats of the Recirquel Company from Budapest, Hungary. With the music set, the choreography was also finalized and the acrobats were filmed in a two-day shoot, using green box technology to put the characters into the digital environment. Rather than costumes, the acrobats were painted using a fine body painting technique, in order to fully show off the movements in their bodies to help tell the story. These recordings were combined with the 3D animations produced in Maxin10sity’s studio to create the final visuals. The show itself was delivered via 16 Panasonic 20K laser phosphor projectors and a Pandoras Box system. Maxin10sity’s Karlsruhe performances 300 Fragments, Legacy, and Structures of Life were re-run alongside I’MMORTAL during the 2018 edition of the Schlosslichtspiele. A Maxin10sity weekend also took place, with the shows running exclusively from Friday to Sunday alongside a team Q&A discussion with the audience.